Author(s): Paola Collini, Soft Tissue and Bone Pathology, Histopathology and Pediatric Pathology Unit, Department of Diagnostic Pathology and Laboratory Medicine, IRCCS Istituto Nazionale dei Tumori, Via Venezian 1, 20133 Milan, Italy. Marta Barisella, Angela Greco. Thyroid carcinomas derived from the follicular epithelium are rare in children up to 18 years of age. While the morphological features are superimposable in children and adults, the age at onset is relevant to both the frequency of histotypes and variants, and to their biologic behavior. Papillary carcinomas (PCs) represent more than 90% of cases. Follicular carcinomas (FCs) rarely occur, and they are mostly represented by minimally invasive (encapsulated) FCs (MIFCs). Poorly differentiated carcinomas (PDCs) are very rare, while anaplastic (undifferentiated) carcinomas are practically nonexistent. PCs arisen in children have an overall survival of about 100% independently of the parameters associated with a bad outcome in adults. In pediatric ages the solid/trabecular variant is particularly frequent, together with PC, NOS. The occurrence of a solid/trabecular pattern of growth is one of the most frequent pitfalls in the differential diagnosis with the ominous PDCs. In children even the PC variants reported as high-risk in adults like the tall cell variant, seem to follow an indolent behaviour. MIFC has to be carefully distinguished from follicular adenoma and the encapsulated follicular variant of PC. The high risk, widely invasive FC, which in adults has an overall survival superimposable to PDC, is only occasionally seen in children. In the last decades, in particular following the Chernobyl accident, the pediatric PCs genetics has been extensively studied. Keywords: Children, differentiated thyroid carcinoma, histopathology, molecular biology, papillary carcinoma, poorly differentiated carcinoma. Affiliation:Soft Tissue and Bone Pathology, Histopathology and Pediatric Pathology Unit, Department of Diagnostic Pathology and Laboratory Medicine, IRCCS Istituto Nazionale dei Tumori, Via Venezian 1, 20133 Milan, Italy. Keywords:Children, differentiated thyroid carcinoma, histopathology, molecular biology, papillary carcinoma, poorly differentiated carcinoma. Abstract:Thyroid carcinomas derived from the follicular epithelium are rare in children up to 18 years of age. While the morphological features are superimposable in children and adults, the age at onset is relevant to both the frequency of histotypes and variants, and to their biologic behavior. Papillary carcinomas (PCs) represent more than 90% of cases. Follicular carcinomas (FCs) rarely occur, and they are mostly represented by minimally invasive (encapsulated) FCs (MIFCs). Poorly differentiated carcinomas (PDCs) are very rare, while anaplastic (undifferentiated) carcinomas are practically nonexistent. PCs arisen in children have an overall survival of about 100% independently of the parameters associated with a bad outcome in adults. In pediatric ages the solid/trabecular variant is particularly frequent, together with PC, NOS. The occurrence of a solid/trabecular pattern of growth is one of the most frequent pitfalls in the differential diagnosis with the ominous PDCs. In children even the PC variants reported as high-risk in adults like the tall cell variant, seem to follow an indolent behaviour. 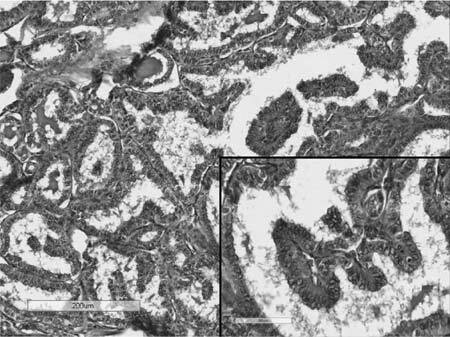 MIFC has to be carefully distinguished from follicular adenoma and the encapsulated follicular variant of PC. The high risk, widely invasive FC, which in adults has an overall survival superimposable to PDC, is only occasionally seen in children. In the last decades, in particular following the Chernobyl accident, the pediatric PCs genetics has been extensively studied.